I read somewhere, I think on one of these forums, that it's possible to run the repeater, the server and also the Instant Support on the same computer. Not that I have a real-world reason to do this, I decided to try it to see if it would work. Well it didn't so I thought I'd mention it here. I loaded the repeater, and then ran the Instant Support file, and finally the Chunk Viewer. 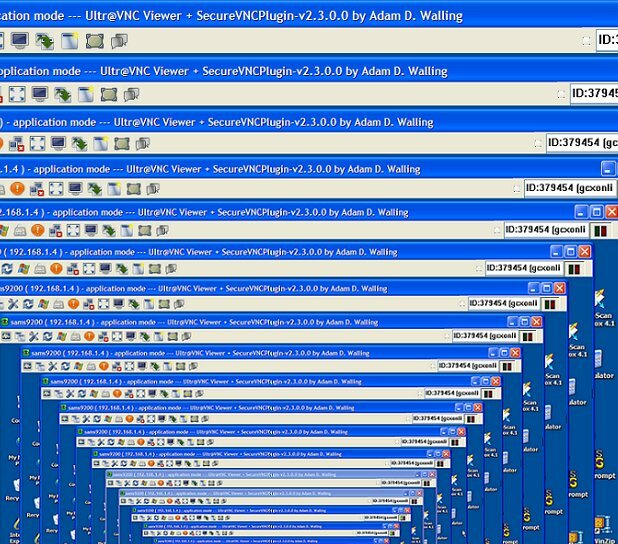 My machine suddenly looped and began generating what promised to be a gazillion nested screens. Here's what I got. Anyone have a clue as to what happened? I don't see the problem.... It's working as intended here. The Viewer is displaying what's on your screen which happens to be the viewer displaying what's on your screen which is the Viewer displaying what's on your screen... etc..
You can achieve the same effect by reflecting 2 mirrors at each other. As Chunk says... it's normal when you run both from the same computer. Use 2 different computers on your LAN to get the result you would like. Yup, worked perfectly. What exactly did you expect to happen, smgerber? What did you expect to see on the screen? Sometimes when I do this I hope to see the matrix. DUH! Boy am I sorry I wrote this thread!!! To answer supercoe, I expected to see my own screen. ONCE!!! Now that you've all explained what happened I feel like a jerk. Once of the nice things about the internet is that we get a chance to embarrass ourself over and over again by writing a single post. Anyway, I'll try to put a positive spin on this and tell you all that I'm so happy I was able to bring all this joy to all of you. I won't try to delete the post so that you'll have time to show this to all your friends. My biggest regret is that "smgerber" is my real name. Honestly, EVERYBODY gets a bit freaked out the first time they do that. I still nervously hover over alt-F4 because I'm afraid I'll run out of memory and crash. So welcome to the VNC tinkerer club. Don't worry man, no one is giving you a hard time. I've had plenty of documented DUH! moments as well. The nice thing about this group is we are !nice! Some other groups I'm associated with not so much! So let's all post a "duh" moment! ... then I noticed that I was trying to connect the Viewer with the Server port. Talk about DUH! Especially for someone who has been "in it" for the last 2+ years. We all have moments, I like to think of them as "learning experiences". Mainly because when you make a silly mistake it sticks with you forever.